It was a great year skiing here in the upper Midwest. My season lasted from early December 2013 through March 2014. 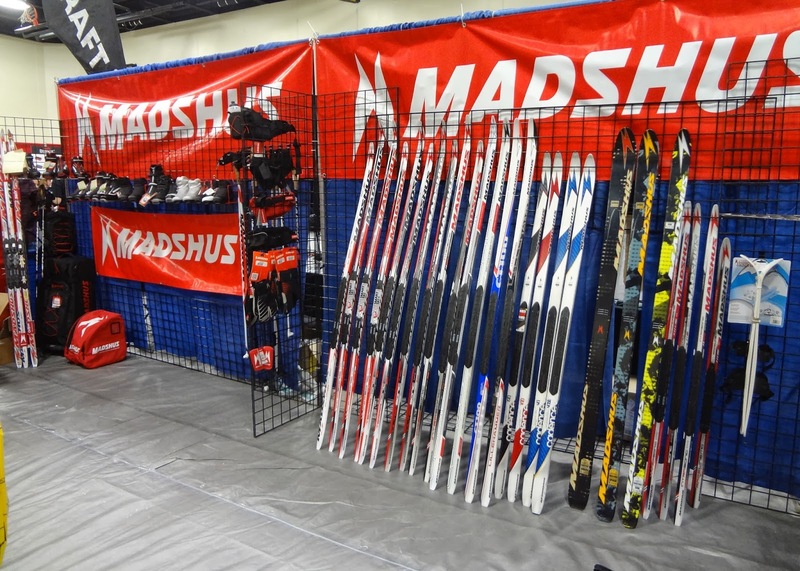 In this post I will catch up on the times I skied since the American Birkebeiner in February. I thought it might be time since I put my skies away the first weekend in April and got my bike ready the second weekend. Except for a few lakes in southern Minnesota the lakes all still have ice on them. 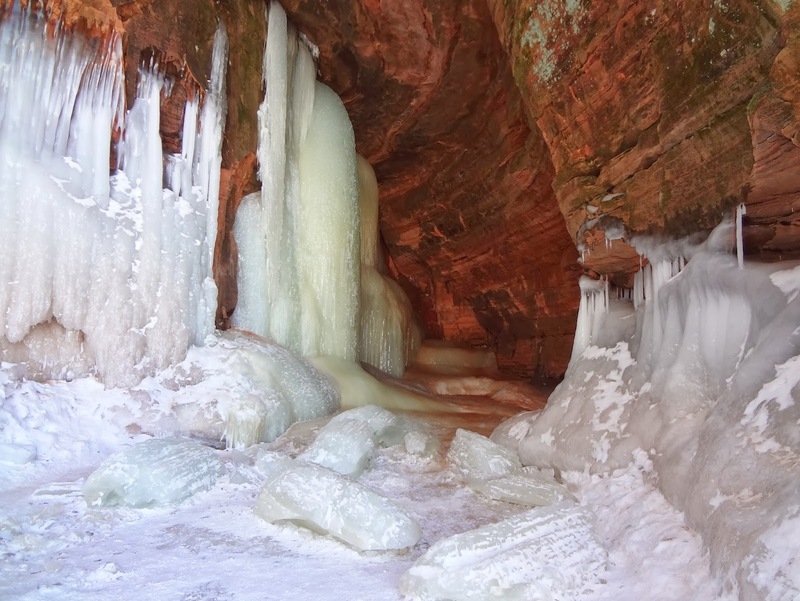 One of the later years for "ice out" in some time here in Minnesota. 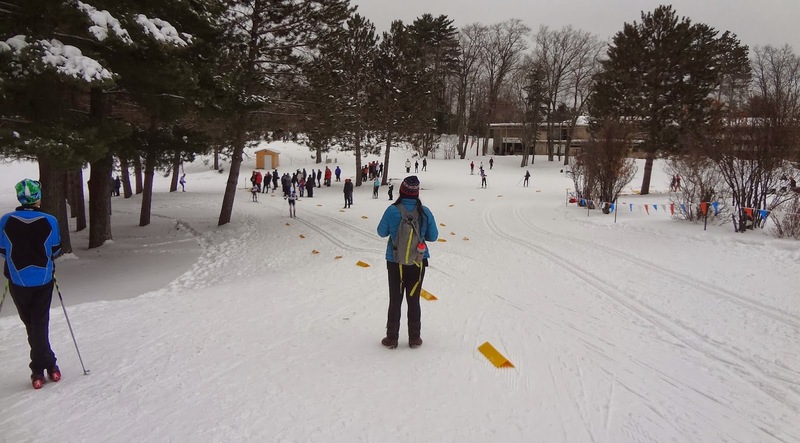 The picture to the left was taken at Wirth Park in Minneapolis on March 29, 2014, which was the last day I went out skiing this season. It was the last weekend that Wirth was open and the conditions were very spring like. 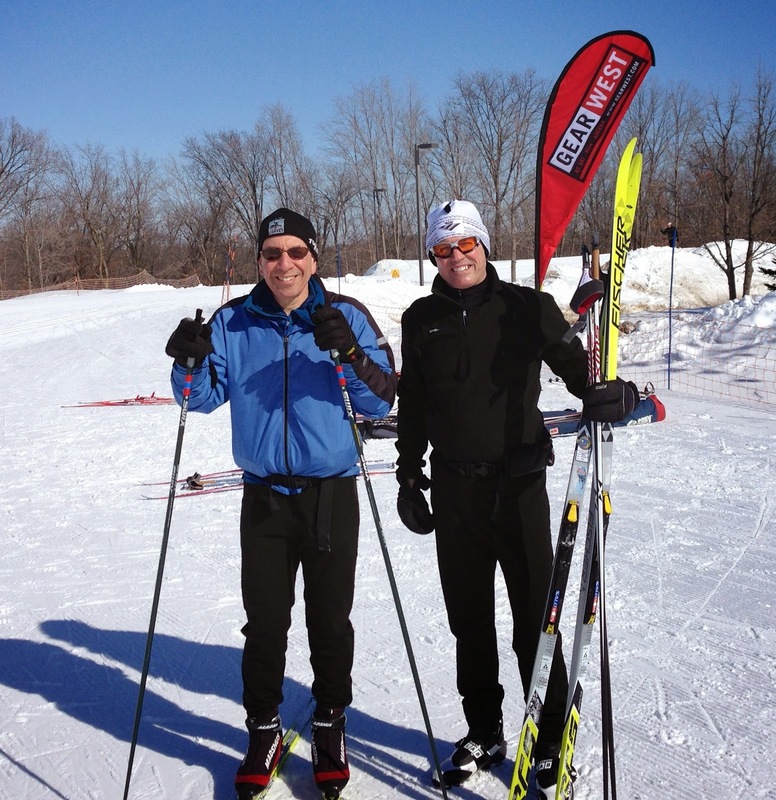 On March 8, 2014 I went skiing with Brian Milavitz at the Elm Creek Park Reserve in Maple Grove, Minnesota. The conditions were darn near perfect with temps at -5C and the snow was in perfect condition. I did 9K on this sunny day. 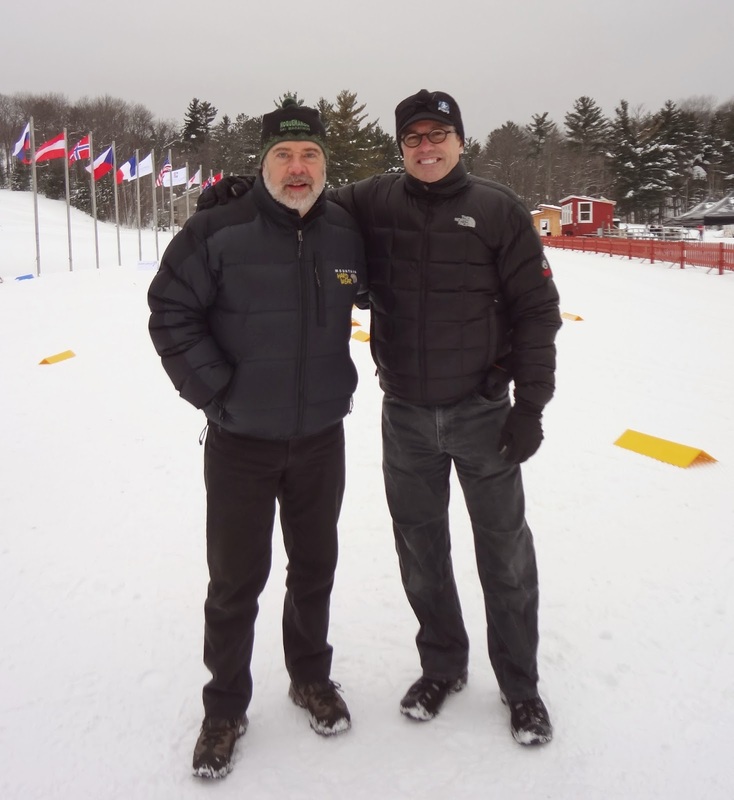 Brian and I know each other from working on the Sponsorship Committee for the City of Lakes Loppet in Minneapolis. Brian and I are also Birchleggers through the Birchleggings Club with Brian finishing his 24th this year and the 27th for me. 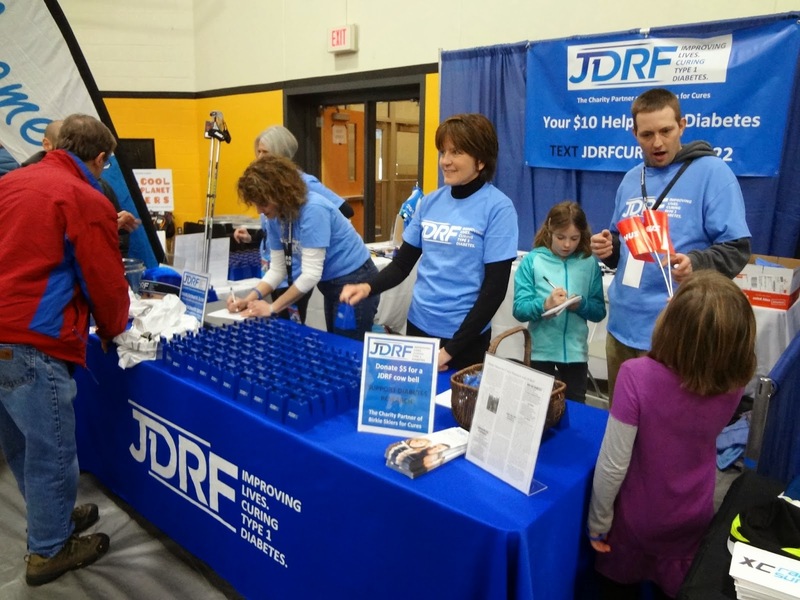 He is also a fellow healthcare administrator and has held various positions in the Twin Cities with the most recent at Fairview Health System. Brian is also an excellent skier and on this particular day I was either coming down with something or just plain tired. Still a nice ski on beautiful sunny day. What a difference a day makes! 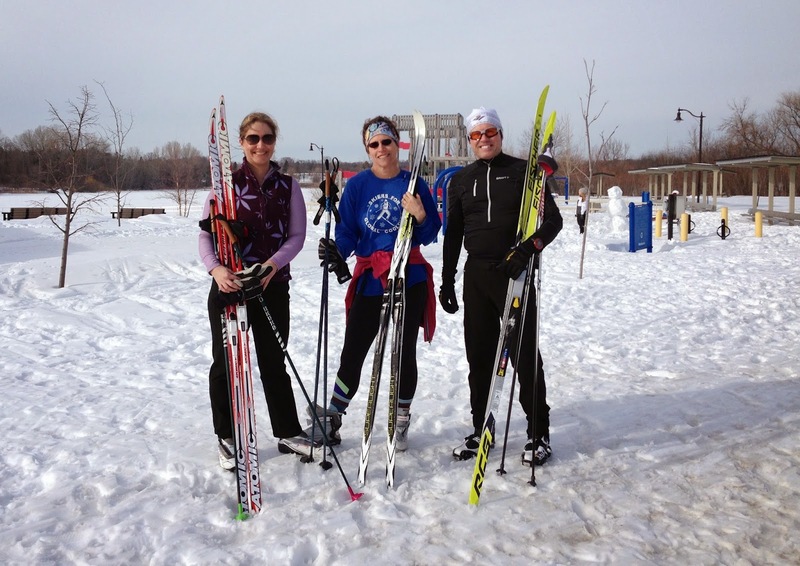 On March 9, 2014 I skied about 10K with Cynthia Ostreling and Mary Pekala at Wirth Park. 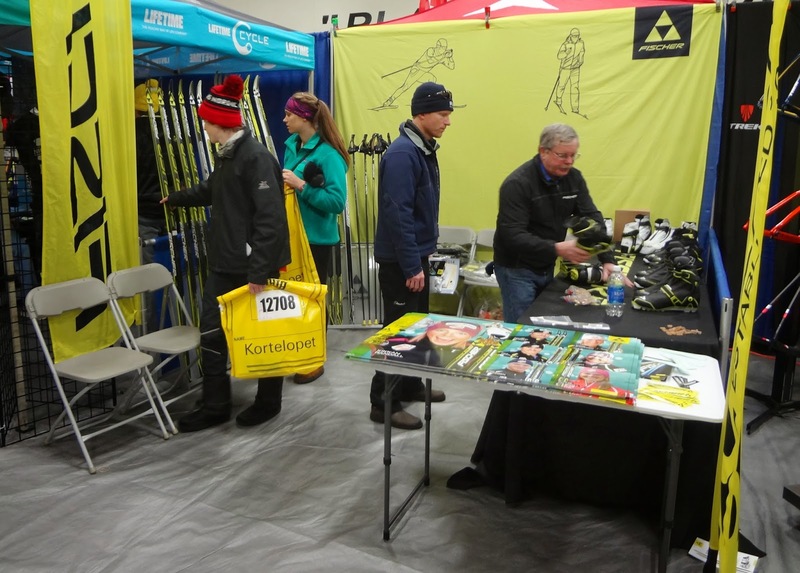 Cynthia and I were introduced when she was working the City of Lakes Loppet booth and I was working the North Star Ski Touring Club booth next door at the Midwest Mountaineering Winter Outdoor Expo in November 2013. 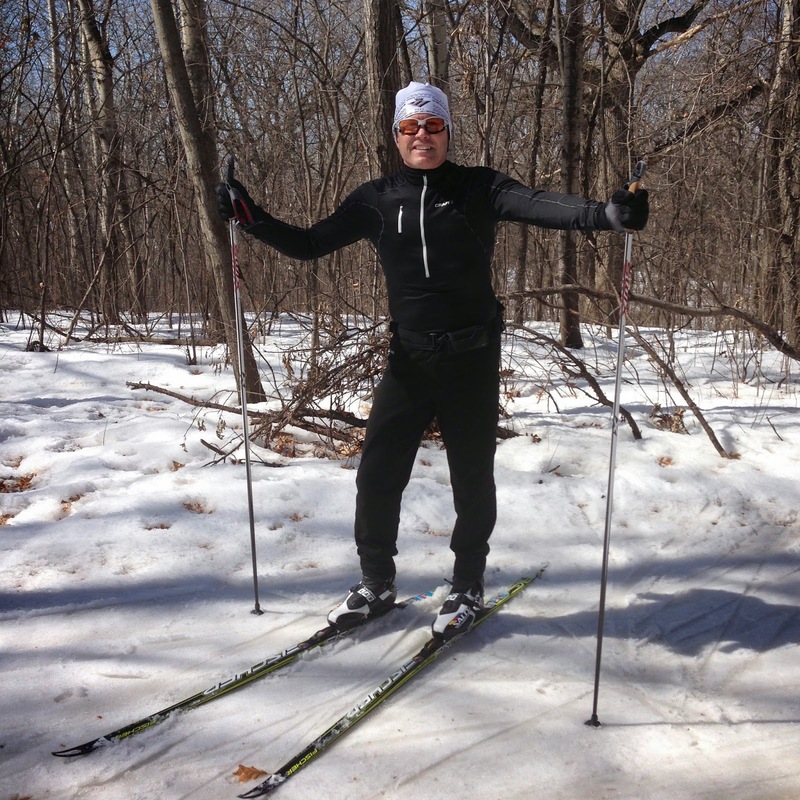 Cynthia has done several Birkie and City of Lakes Loppet races. 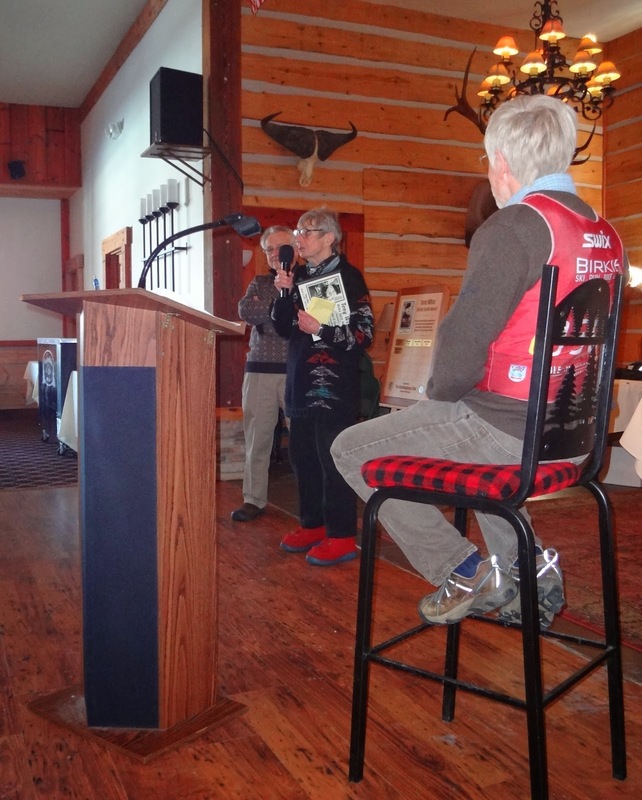 Mary also is both a Birkie and Loppet veteran and she too volunteers for the City of Lakes Loppet. The temperature was about 5C with wet snow. 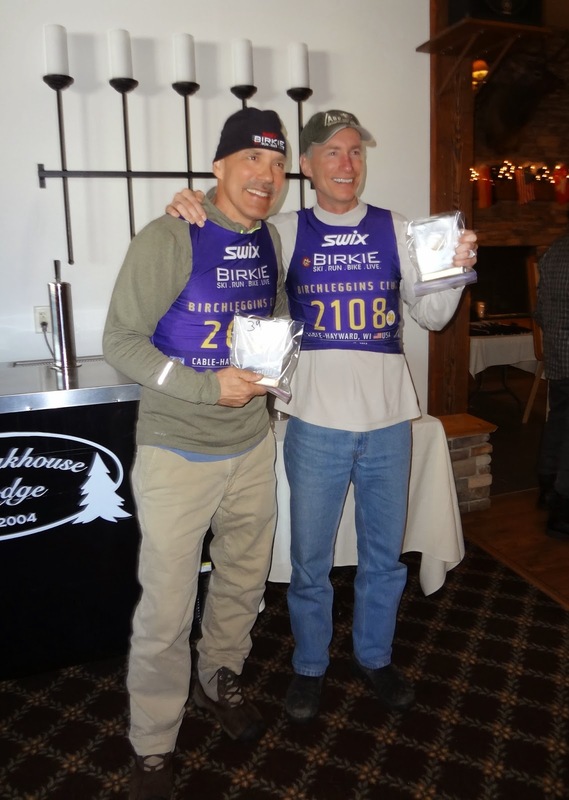 The weekend of March 15 and 16, 2014 I skied with my good friend and Birkie Buddy, Tim Burke. 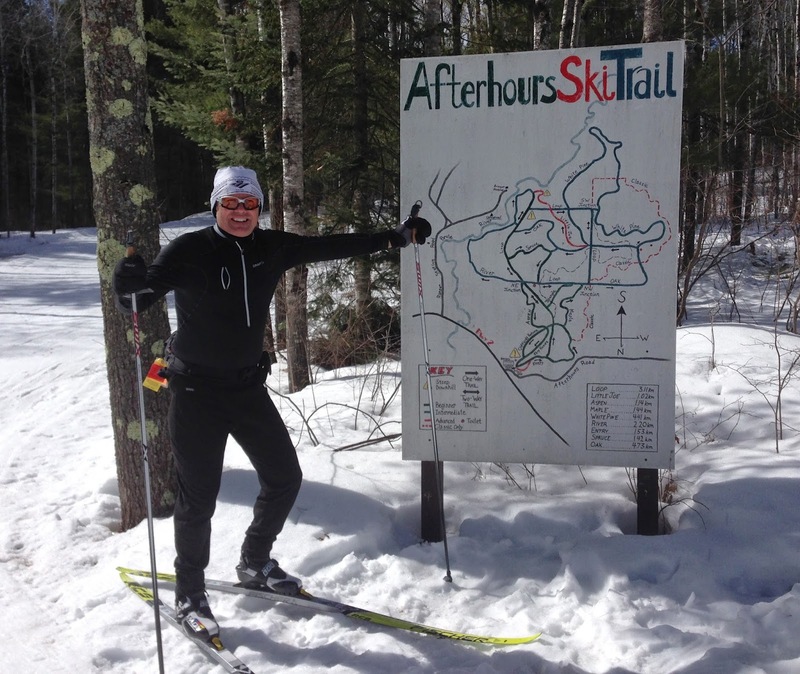 We spent Saturday at the After Hours Ski Trail in the Brule River State Forest in Brule, Wisconsin. Unfortunately the conditions were not very good as the temperature had dropped the night before and with wet snow and a warm up several days before, it was icy and stiff. We still had a nice time. 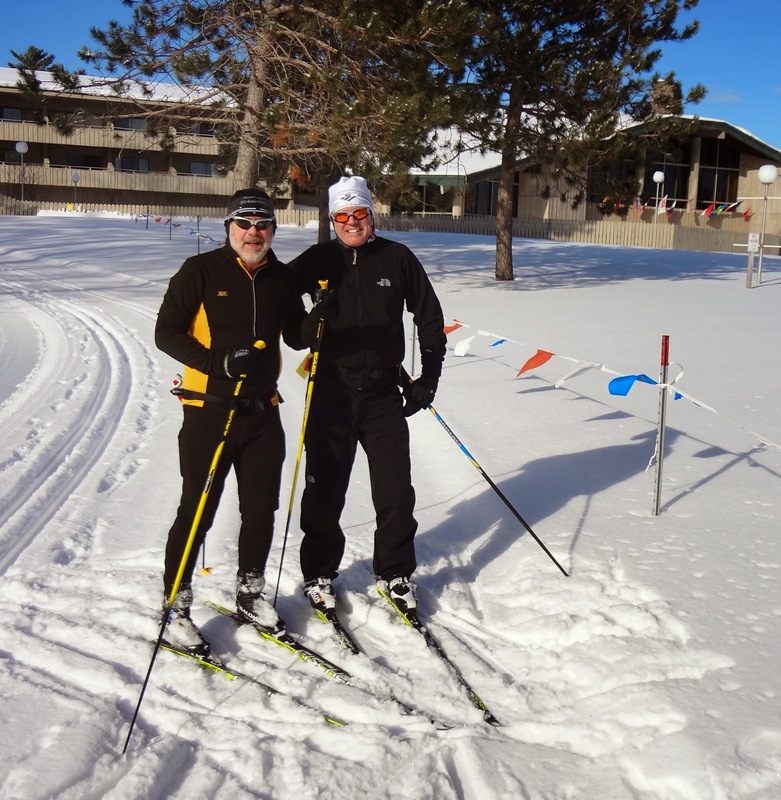 On Sunday we went over to the Snowflake Nordic Ski Center in Duluth. The temperature moderated and they had groomed the hard snow which made for some of the fastest conditions I skied in all winter. We skied a few loops for about 10K. When we were getting ready to leave we ran into a new Birchlegger, who had finished his 20th race in February. The picture to the left is of Tim and I with Marty Mattes. He and his wife are from Eau Claire, Wisconsin and were also skiing at Snowflake for the day. On Wednesday, March 26, 2014 I was asked to cover for a meeting for one of our Life Link III base managers. The meeting was the Lake Superior Regional Trauma Advisory Council and was held at the Hayward Area Hospital in Hayward, Wisconsin. I threw my skis in the car not knowing what time the meeting would end and what the conditions were going to be on the Birkie Trail. I got out of the meeting around 16:00 and stopped over at the New Moon Ski Shop where I got an excellent report on fresh grooming at Double OO in Seeley, Wisconsin. I drove up to Double OO and got into my ski gear and went out for what ended up to be the best ski of the season. I felt like I was in the elite wave at the Birkie as the conditions were perfect. The temperature was 0C with no wind and a late afternoon and early evening sun. I skied about 15K from Double OO to the Boedecker Road rest area and then back to Double OO on the Classic Trail. 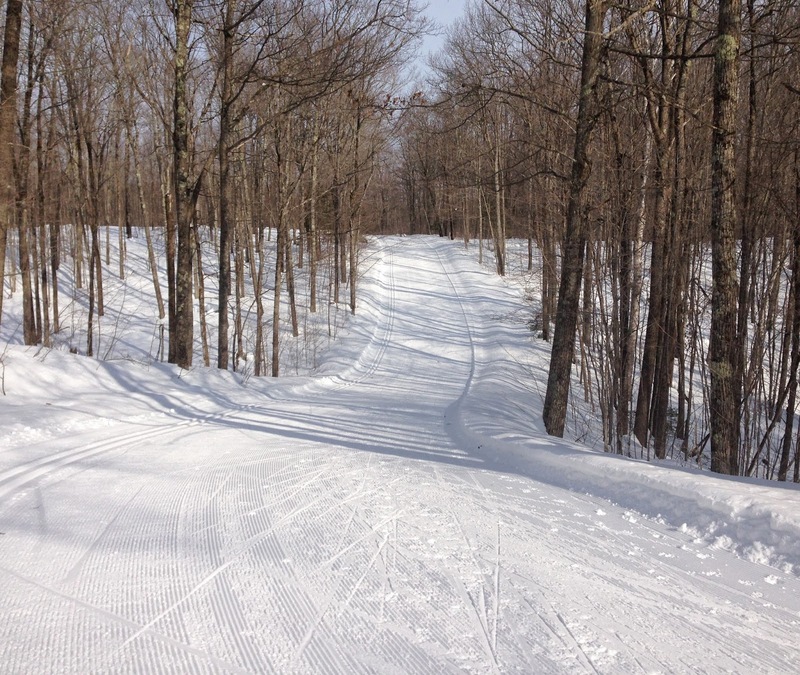 I also skied around the trails at Double OO. The pictures to the left is one of several I took on the trail. It was so beautiful to see the trail in such incredible condition! The Birkie trail has inspired me for over 29 years now and is where I find inspiration and peace. As noted above, I skied my last day on March 29, 2014 at Wirth Park. The conditions were not great but still nice to get out for some local skiing. I only skied about 6K and the temperature was about 7C and partially sunny. I love this picture because you can see the Minneapolis skyline several times from Wirth Park. This particular shot was taken from the start area of the City of Lakes Loppet across Wirth Parkway. 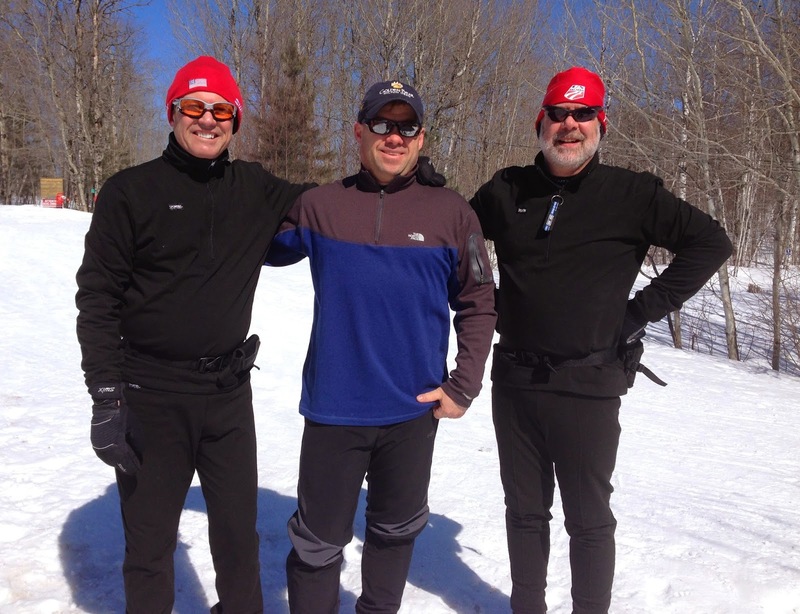 It was another great Birkie Week with my fellow skiers, Tim, Mike, and Joel from February 14th through February 23rd. 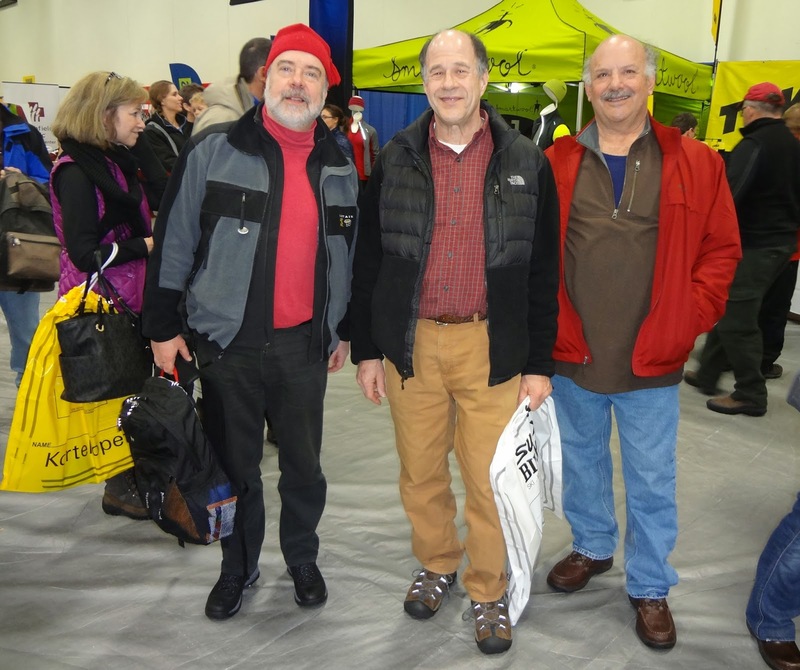 Tim and I started going to the American Birkebeiner in 1986 and Mike joined us a couple of years later. 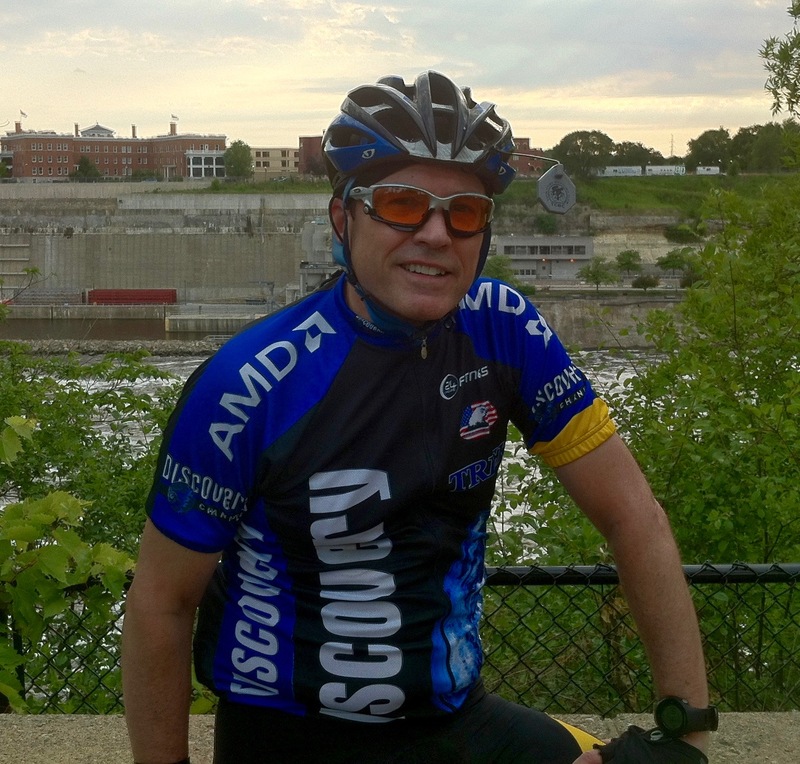 Joel has been coming up from Traverse City, Michigan with Mike for the last two years. 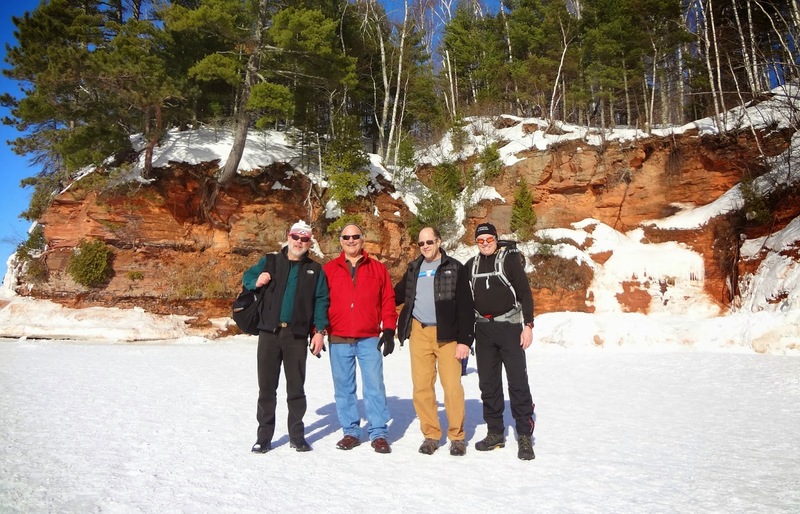 We have stayed at a number of locations in and around the Birkie Trail over the years. 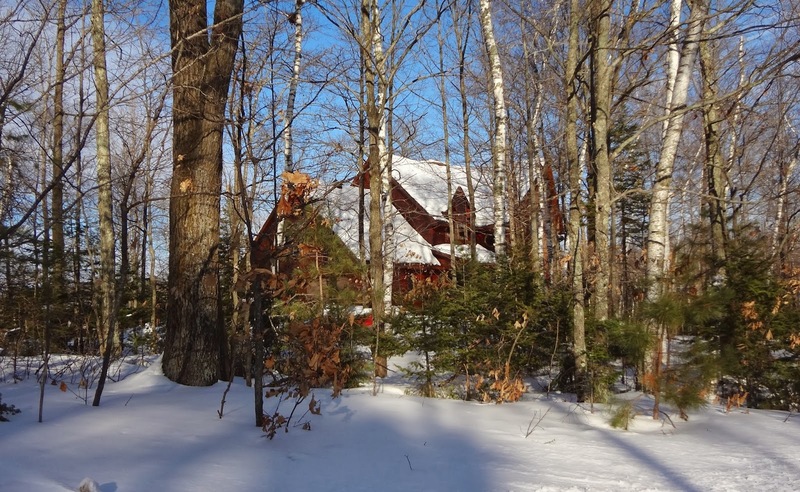 14 Years at the Pilot Fish Inn, I believe 5 years in a cabin on Lake Namakagon, 3 years in a cabin on Clam Lake, and now a beautiful house that sits between Diamond and Crystal Lakes. We have found as we have aged that we wanted more creature comforts including additional bathrooms, a washing machine and dryer, a designated area to wax skis, and now a sauna! This is the view of our house that we are calling our Diamond Lake House. 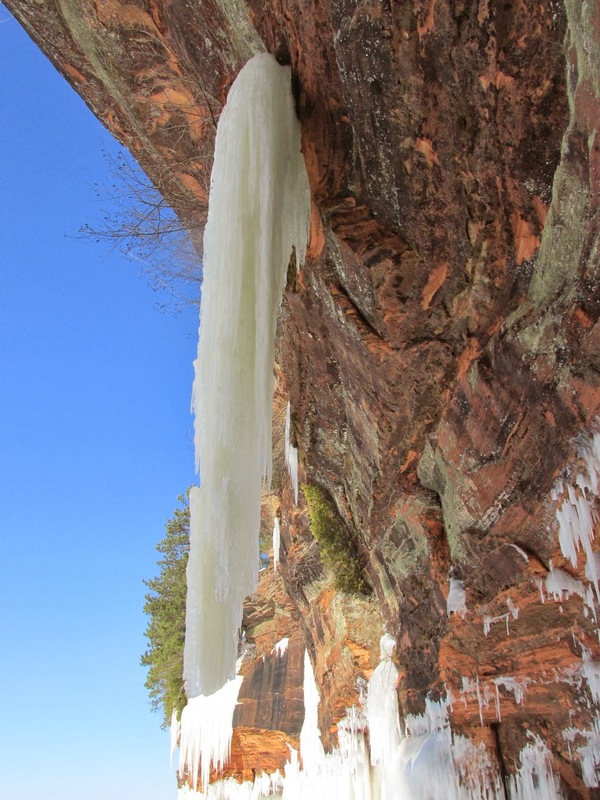 While it is about 25 minutes northeast of Cable, it is well worth the drive to both get to the North Trail Head and the Birkie Start at the Cable Airport. Tim and Joel also especially liked the massive fire place that is available on all three levels of the house. The kitchen was also massive and we have found over the years that we enjoy cooking more and going out for dinner much less. We all bring food and then shop at the grocery stores available in Hayward and Cable. The picture to the left shows the fire place in the main living area, kitchen, and one of the bedrooms upstairs. 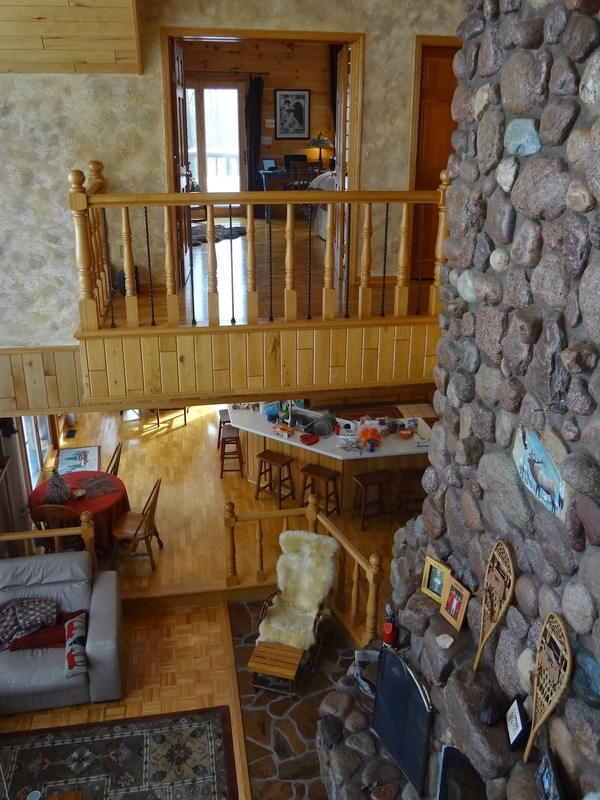 The picture on the right shows the view of Diamond Lake from the upper level out the main window. 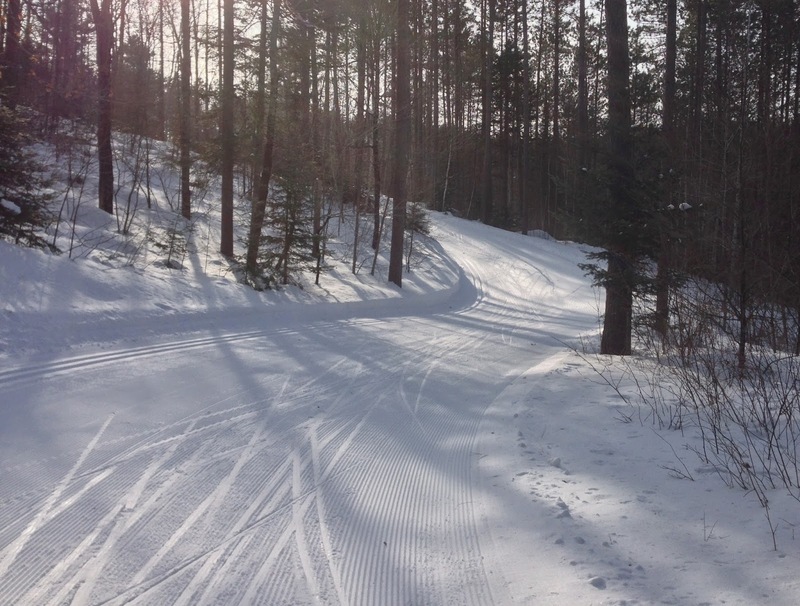 The nice thing about going up for the week is that we are able to get in a lot of relaxed fun type skiing in on the Birkie Trail, which is usually also in fantastic condition. This year was no exception. 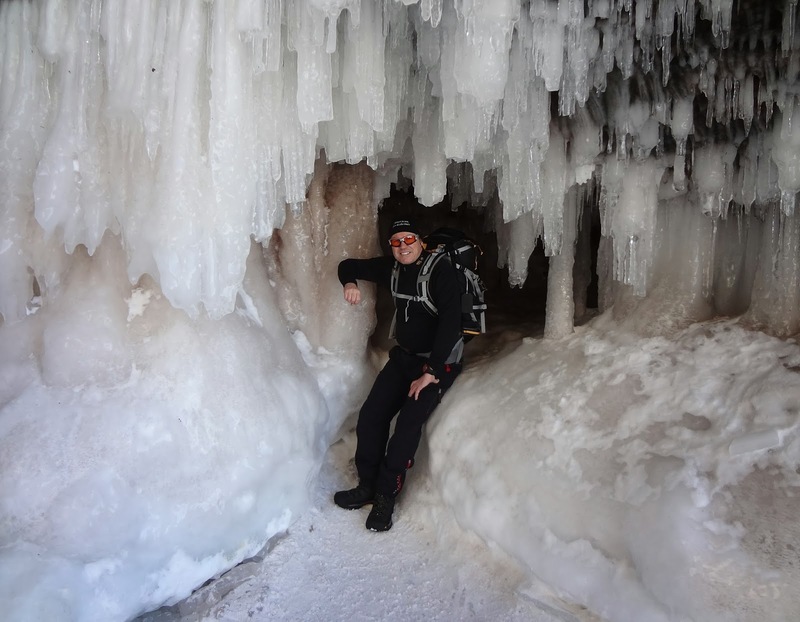 While we did not go out for long skis we do explore many parts of the trail. 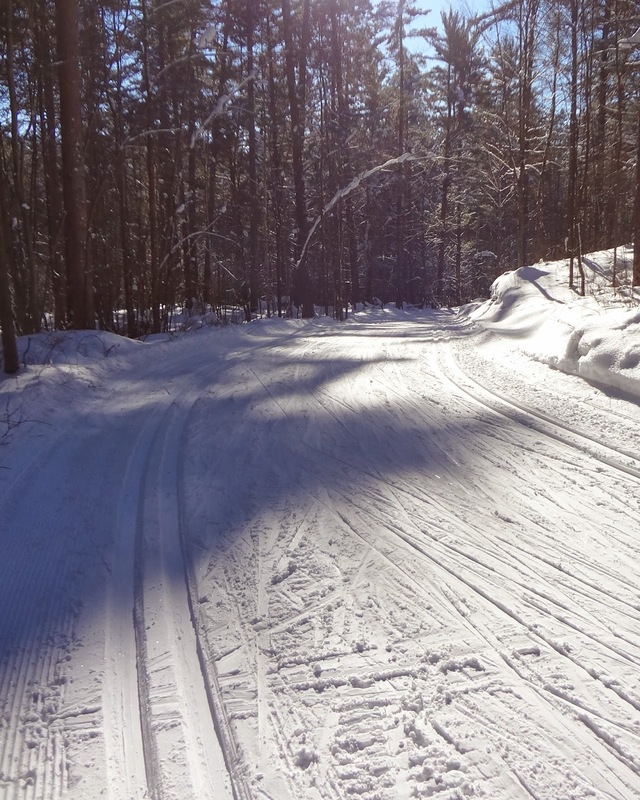 This year we skied on the Kordelopet Trail and both the Birkie Classic and Skate trails from the North End Trail Head to Highway Double OO in Seeley. On Thursday before the race I also skied south on the trail toward Hayward from Double OO. The picture to the left is after our first day of skiing from the North Trail Head. 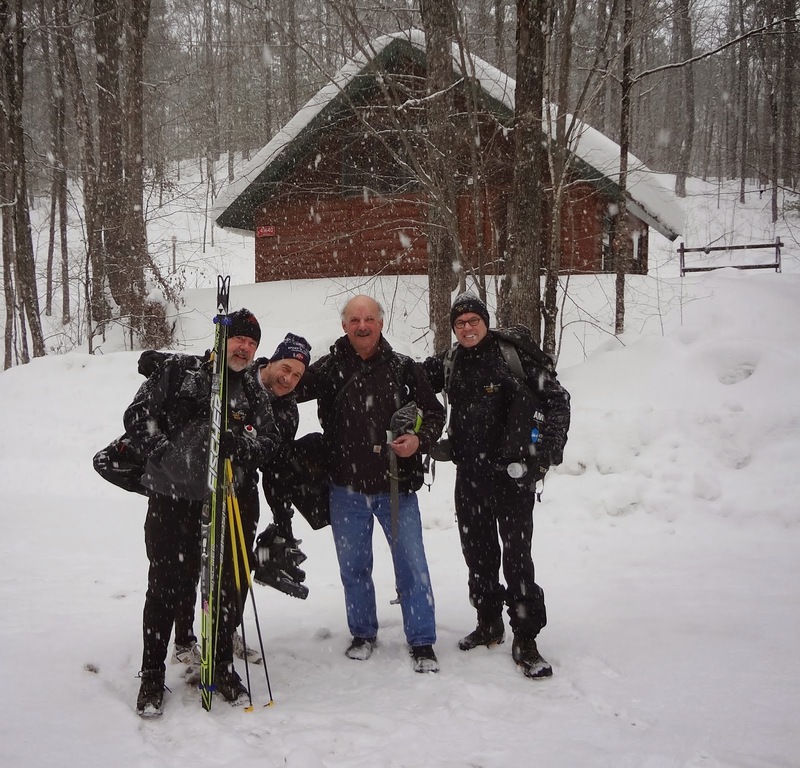 The pictures below are when we skied on the Kordelopet Trail to the Telemark Lodge. Unfortunately the Lodge has been closed for a few years now. At one time this was the center of activities for the Birkie race. 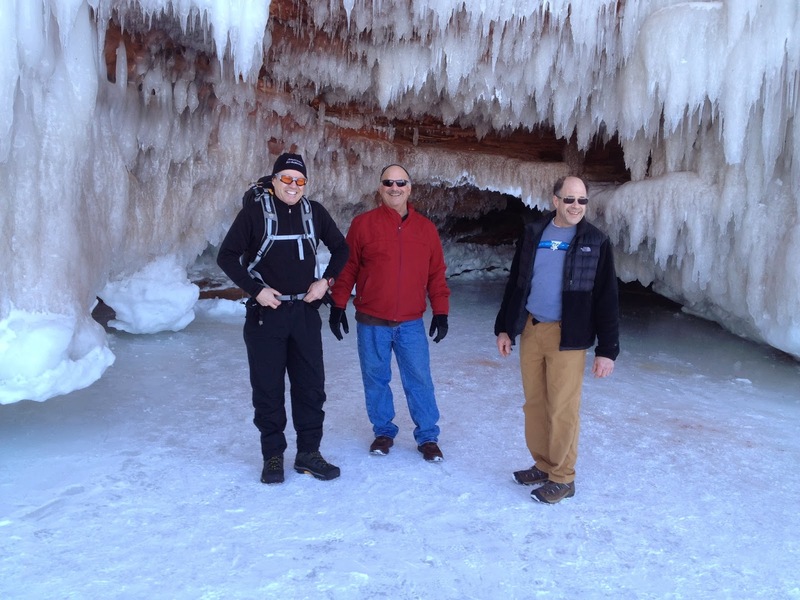 This year we took a day off from skiing and went up to Lake Superior near Conucopia, Wisconsin to see the Ice Caves. 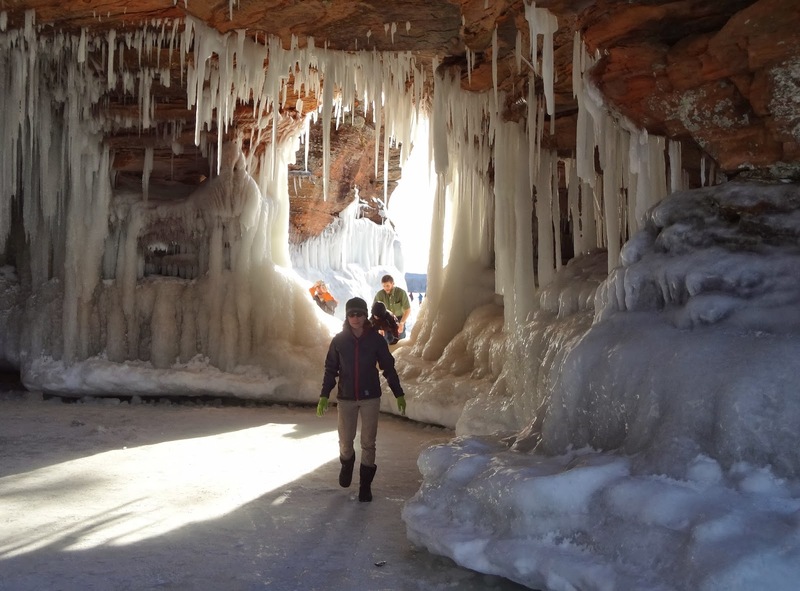 Not since 2009 has the lake been frozen enough to walk out on the ice to see the caves. 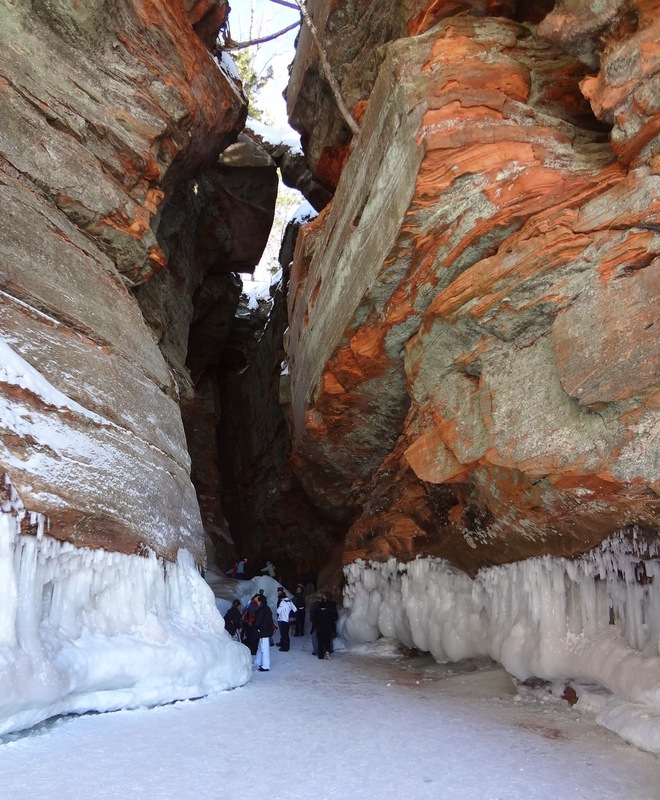 It was especially interesting to me because I had gone on a sailing trip around the Apostle Islands in August and had pictures of the caves from then. This is also a big area for kayaking where you can go into the caves that have been formed from wave action. In the winter they are just incredible as the pictures below show. 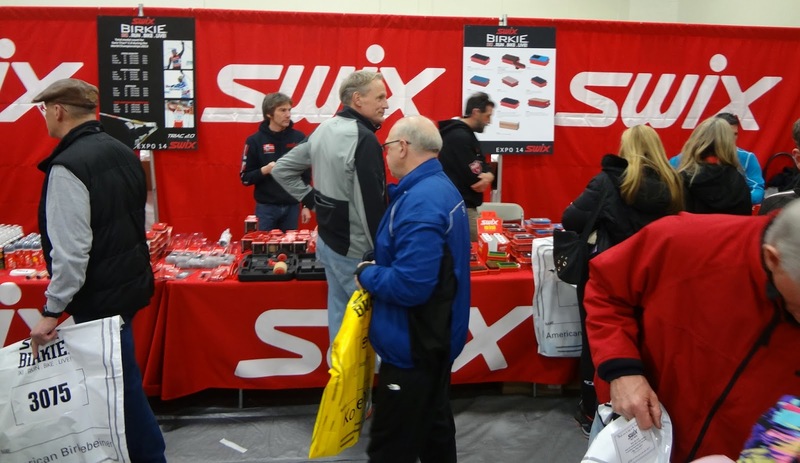 Another part of the annual experience of the Birkie is picking up our bibs and exploring all the booths at the expo. This used to be at the Telemark Lodge and now for the past several years is located at the Hayward Middle School in Hayward. 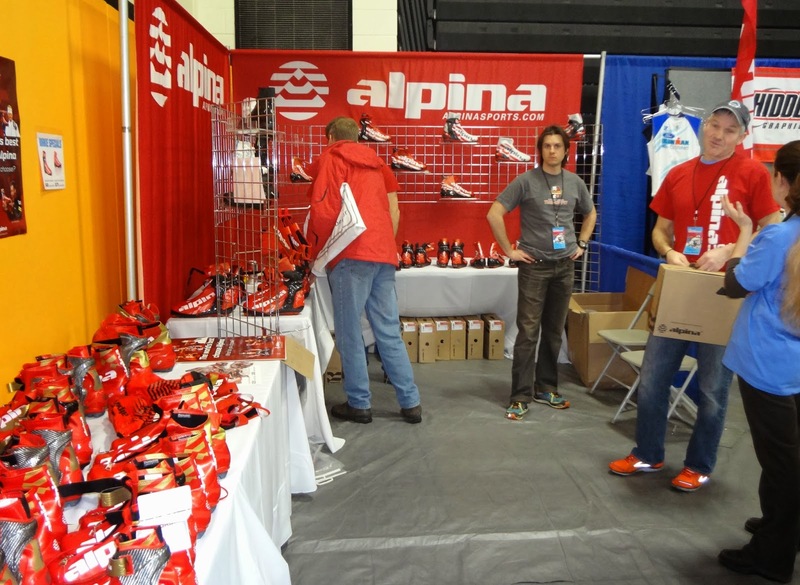 I also like taking pictures of all the vendor booths and then compare from year to year. 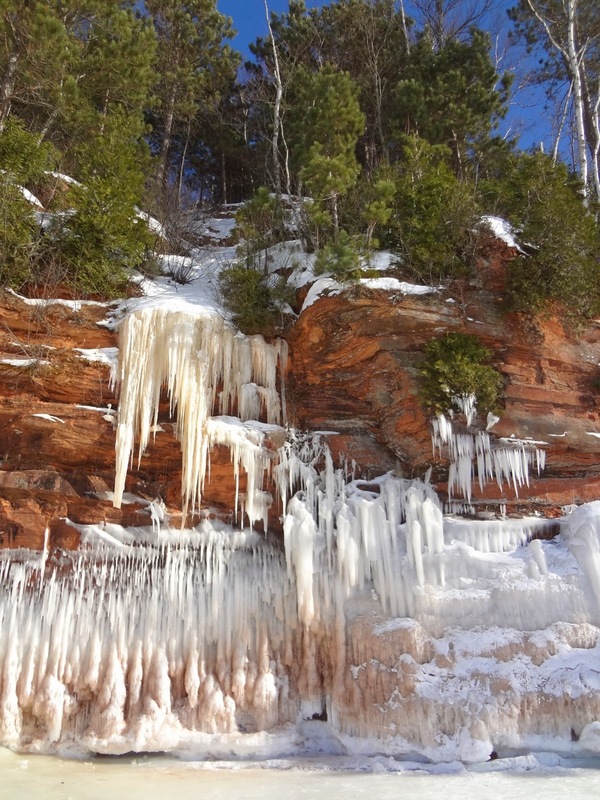 The pictures below are a sampling of the pictures I took this year. For more pictures go to the Birkie Web Today Facebook page. 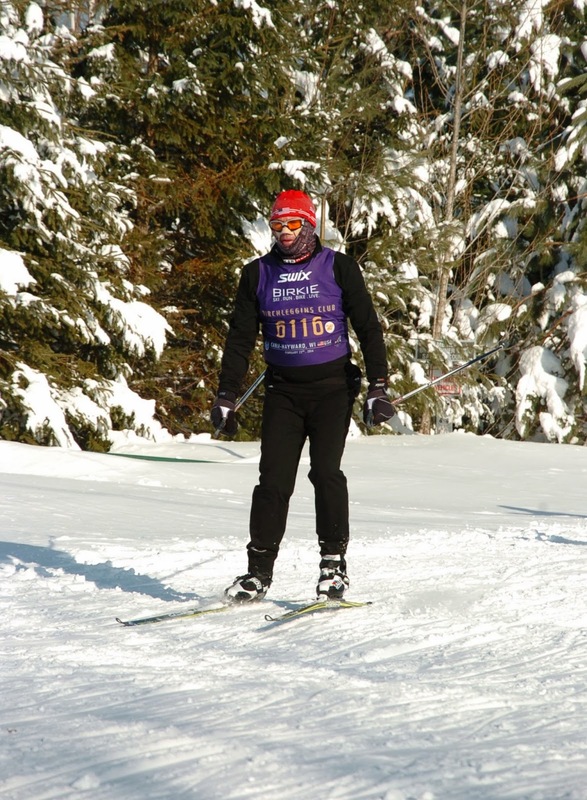 I am a board member and in charge of social media for the Birchleggings Club, which is for all Birkie skiers that have skied 20 or more Birkie races. 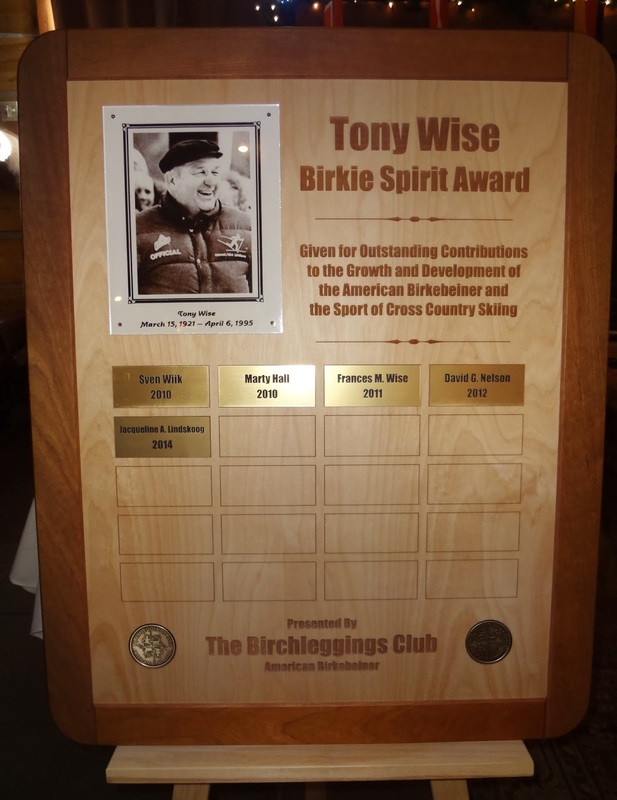 On the Sunday after the Birkie there is an awards dinner in Hayward where all 20 year skiers are presented with their plagues. 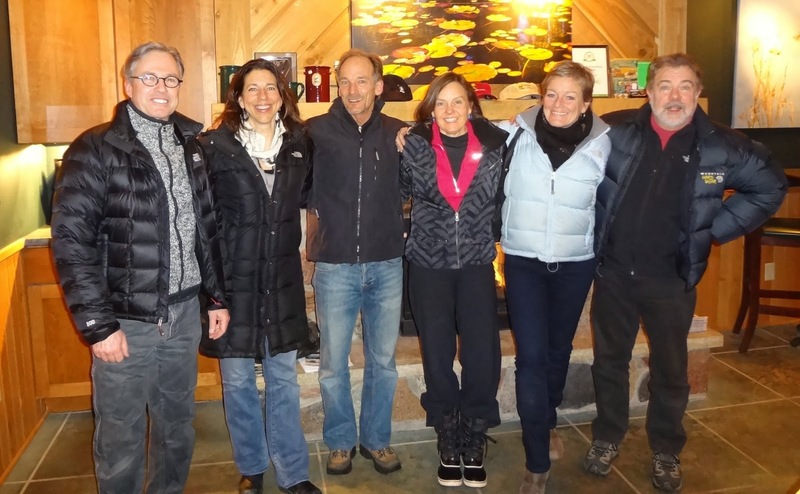 Now that we have many skiers completing 30 years there is also a plague presented for these skiers. We also have a few skiers that have completed 40 years, and just one that has completed all 41 years, Ernie St. Germaine. 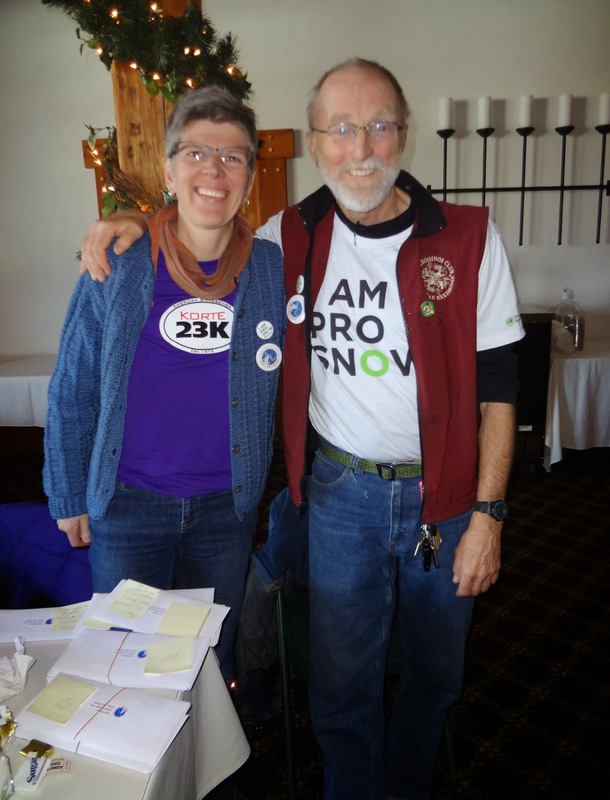 John Kotar is the founder of the Birchleggings Club and our current President is Gale Otterholt. For more information and pictures go to the Birchleggings website. Below are a few pictures from the awards banquet. Below is a picture of me out on the trail during the race on February 22, 2014 taken by the official Birkie photographers. While we had a very nice warm week the day before the race we had 18 inches of snow with 50mph winds. This caused havoc with the race as both the warming hut at the start area in Cable and the changing tents at the end in Hayward blew over. Additionally with the snow it made it difficult for parking and for the buses to get skiers to the start on time. Many skiers were late for their waves, including Tim and I. We got off nearly a full wave behind, so the official times were off quite a bit for many skiers. To compensate next year, the race is going to accept times from the last 4 years rather than the usual 3 for wave seeding purposes. Unfortunately, the race took away the individual start chip timing and instead went to wave starts. Not a good year to do this and I am sure it will be put back for all races in the future. All in all, however, the Birkie Foundation and all the volunteers did a fantastic job given nature's curve mall the day before. Thank you staff and volunteers! 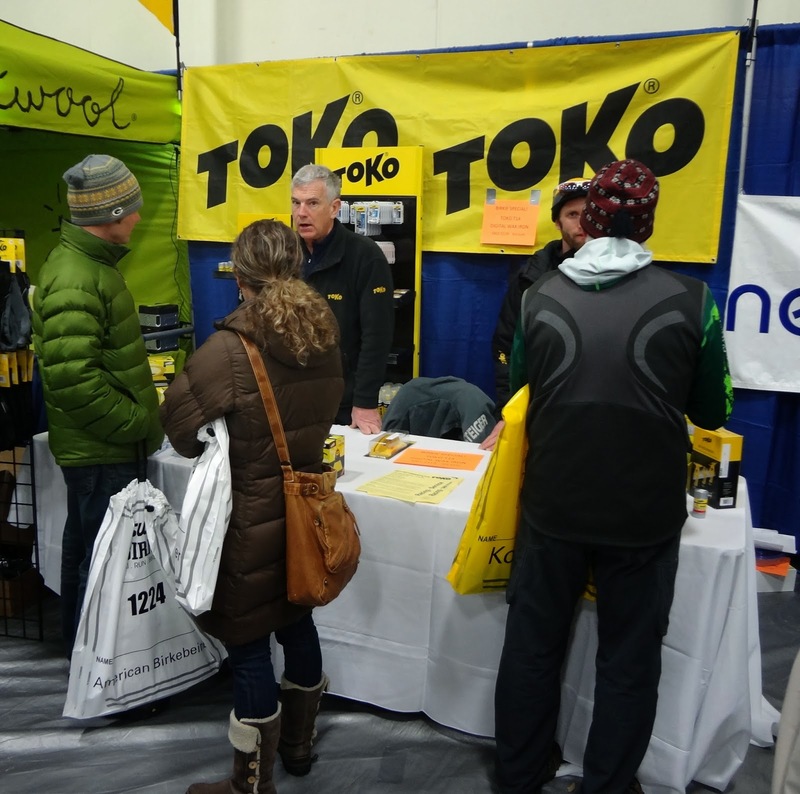 Because of the difficult conditions at the start, with a temperature of 0F and a 15mph wind, many skiers either did not show up or dropped out. It was one of the slowest years for me but I mentally just get into the joy of the race, the sunny day, and that I had my skis waxed well. The upload from my Suunto can be found at this link http://www.movescount.com/moves/move26348033 on the Moves Count website. The Birkie has also been a spiritual experience for me as I just love the trail and the silence of the north woods. It is truly a national treasure. This was my 27th Birkie! 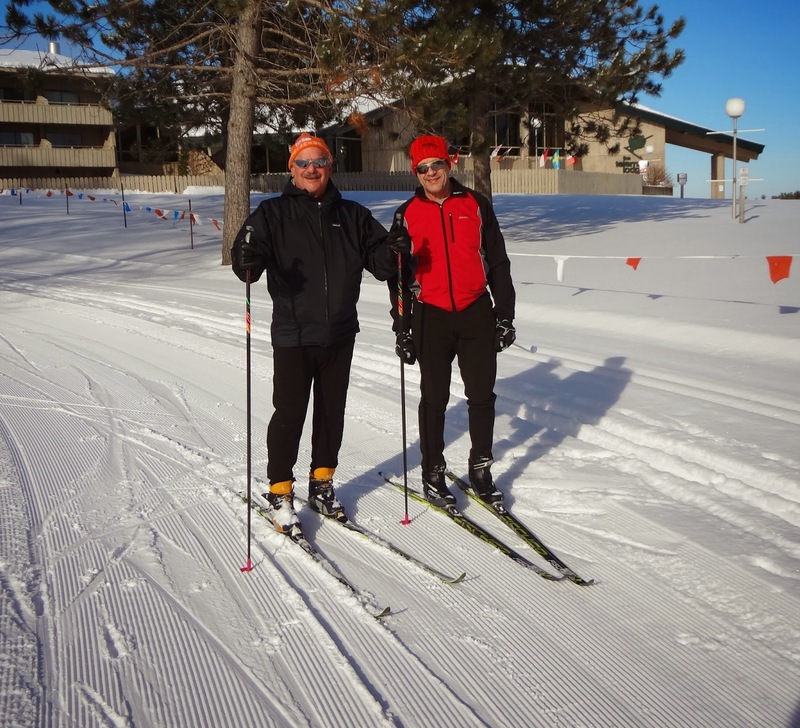 Over the years I have been able to meet skiers that do the Birkie in every place I have lived from the Washington, DC area; Kalamazoo, Michigan; Durham, North Carolina, Kansas City, La Crosse, and now the Twin Cities. 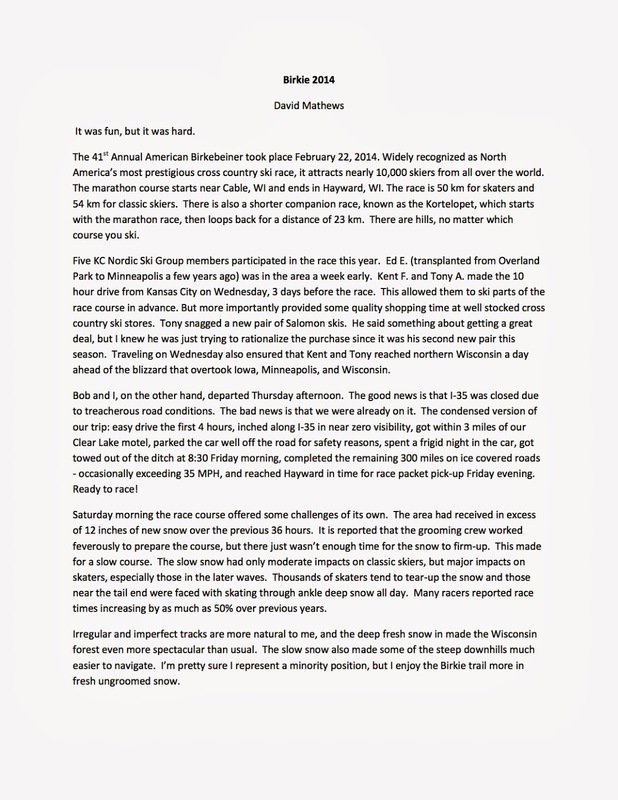 One of my friends, David Mathews, from Kansas City wrote a very nice piece on all the skiers from the Kansas City area that completed the Birkie this year. I asked him for permission to include it in my post, which he has graciously agreed to. Thanks for including me in the write-up David! I participated in the 5th Birkie Tour on Saturday, January 18th on the American Birkebeiner Ski Trail and it was an absolutely beautiful day with excellent snow conditions! 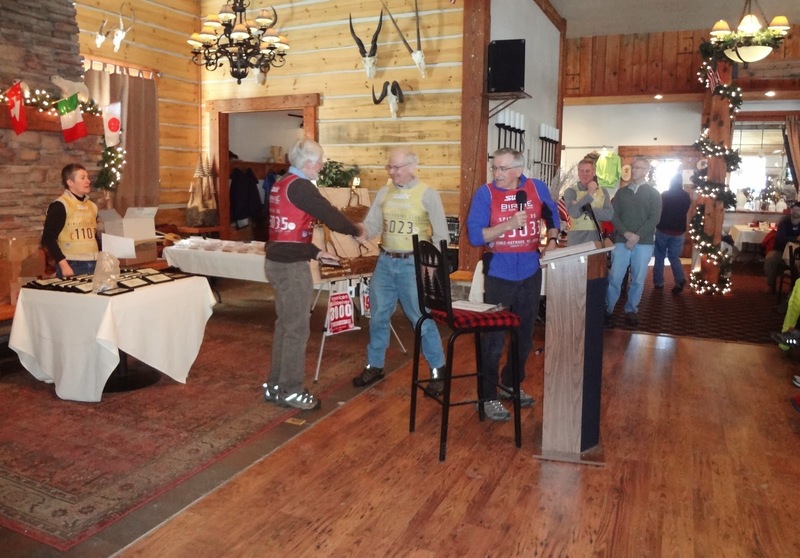 A big thanks to the American Birkebeiner Foundation and all the volunteers that made it such a wonderful day. 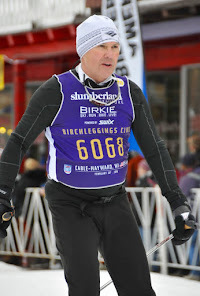 This was my third Birkie Tour as I participated in the second, third, and fifth tours. The forth tour in 2013 was cancelled but I was signed up for it and have the T-shirt. 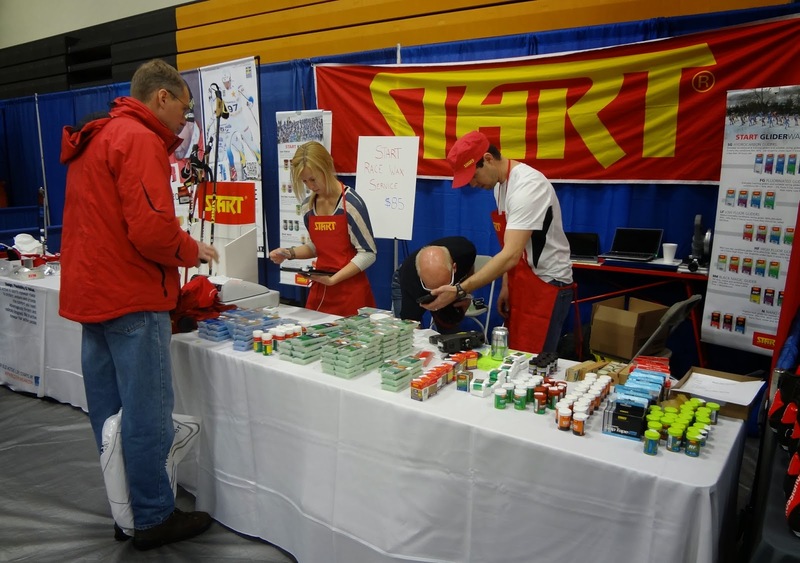 The Birkie Tour is not a timed event, but instead a fun and relaxing one but with aid and food stops. 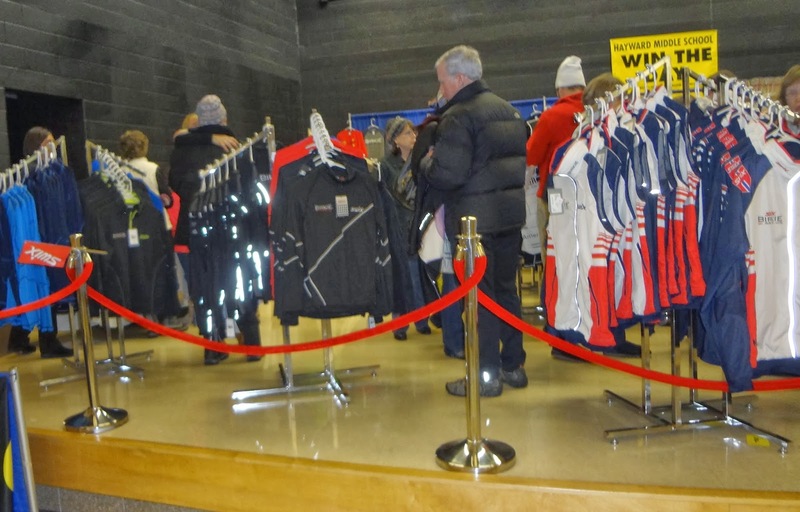 For those participating in the Worldloppet the tour will provide the same credit as doing the regular Birkebeiner ski race without all the crowds. Additionally, with only a small percentage of the skiers the trail stays in really good shape, especially on the downhills. 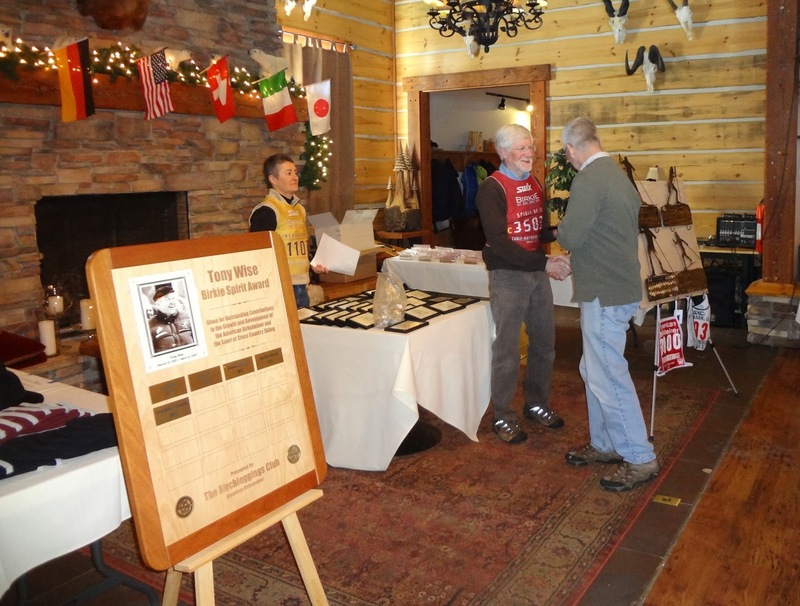 Also participating was Tim, who I have participated in two Birkie Tours with and twenty-six Birkie races. 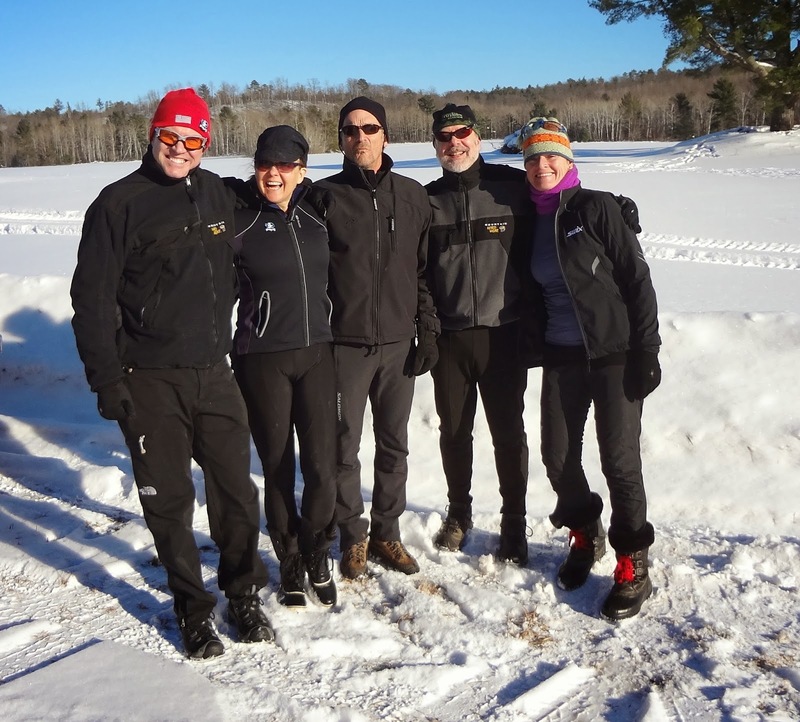 My friends from Minneapolis, Geoff, Deanne, and Carol joined us for their first Birkie Tour and also their first time on the Birkie Trail. Geoff, Deanne, and Carol participated in the 44K route and Tim and I in the 26K route. Pictured from left to right with me are Deanne, Geoff, Tim, and Carol. 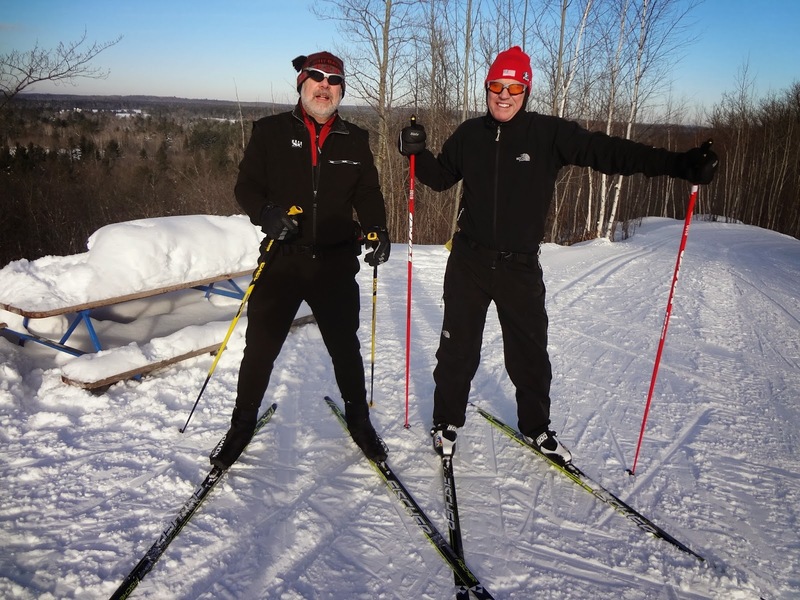 This picture is of Tim and me at the top of the climb up the new Birkie Ridge access trail. This new trail was developed just this past year and is north of Seely, Wisconsin off of route US 63. The climb, which is not part of the regular Birkie race is a tough 3K. Of course it was lots of fun coming back down, as the finish and start were both at the start of this new access trail. This picture was taken on the Classic Trail going towards Double OO. You can see how beautiful this trail is, especially on a sunny day. Temperatures ranged from -18C at the start to -8 at the end. The tour followed the Classic Trail to Double OO then came back on the regular trail, which made for some diversity of terrain. 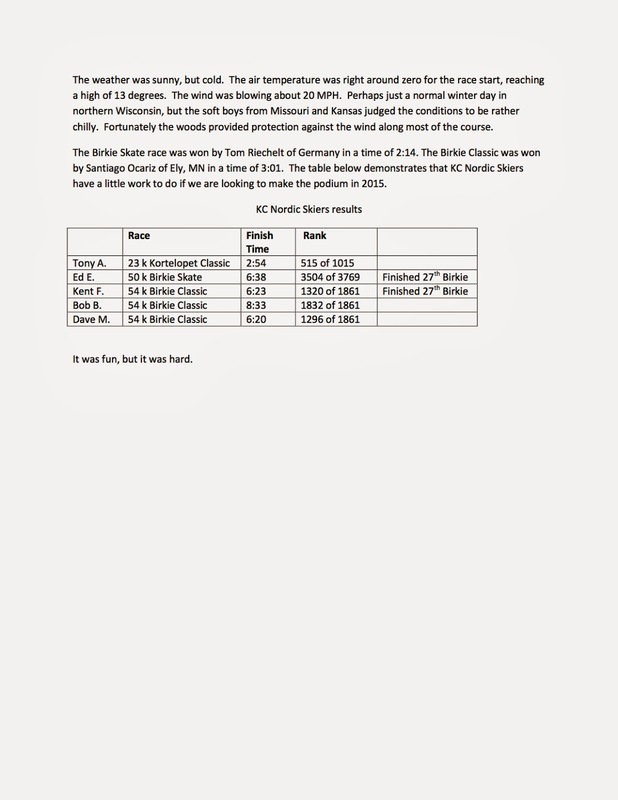 Of course, those that have done the Birkie know that around every corner there seems to be yet another hill! Saturday evening we all met up for dinner at the Rookery Pub east of Cable, Wisconsin. Tim and I have eaten at the pub in past years and keep coming back every year. It is a very quaint and comfortable place with excellent food. During the peak seasons, like the Birkebeiner, they have several different sea foods flown in. If you get up this way it is a great place for dinner or just a drink in the bar. Joining us for dinner was Jackie who was staying at the same Bed and Breakfast as Geoff, Deanne, and Carol in Seeley. The picture was taken in front of the fire place in the bar. Pictured with me from left to right are Jackie, Geoff, Deanne, Carol, and Tim. 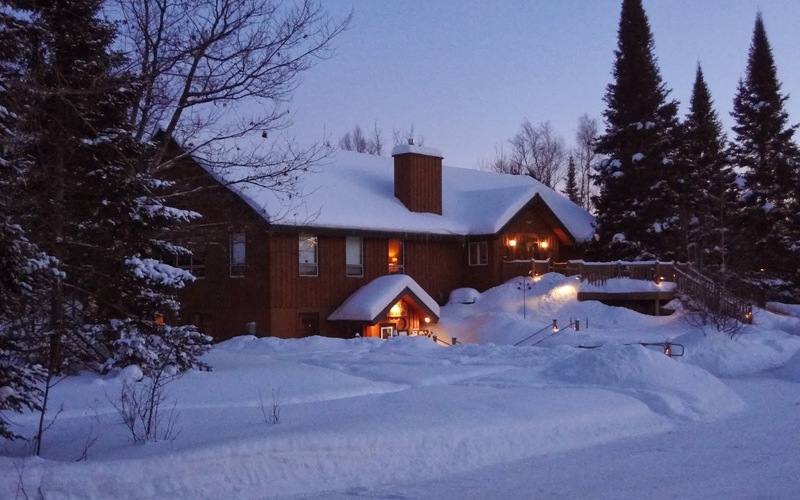 Tim and I stayed at the Lenroot Lodge in Seeley, where we have stayed before for Birkie Tours. The Lenroot is owned by the Sawmill Saloon, which is regular hangout all year around in Northern Wisconsin. They have delicious soup and chili. On Sunday, I was supposed to attend the Birchleggings Club Board of Directors Meeting at the Hayward Library. Unfortunately, I did get up and go to the meeting but at the Cable Library. I realized my mistake when the library was not open and there were no cars. Of course re-reading the e-mail with the proper location detailed made me feel even worse! Knowing I was meeting Tim, I could not get down to Hayward in time. 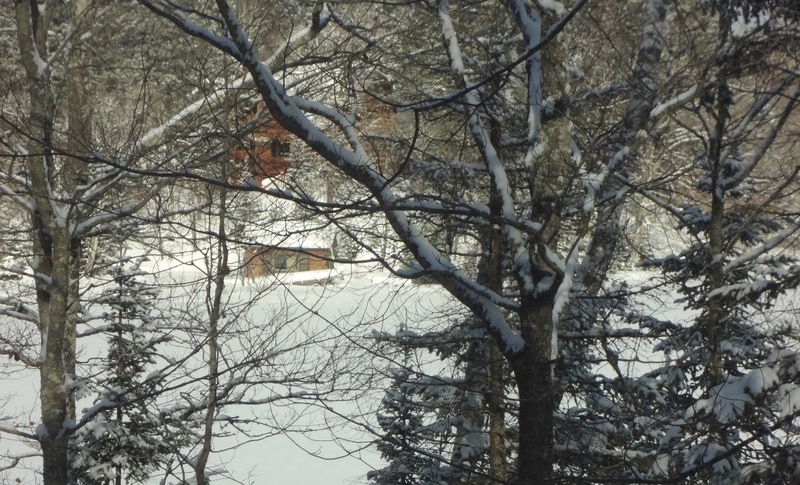 Tim and I also had on our Sunday plan to stop by a new cabin that our fellow Birkie Buddy, Mike, had arranged for us. Since we were a bit early we decided to go over to the Telemark Lodge where the Telemark Chase - Junior National Qualifier races were being held. We were able to see the finish of the Classic Race and also take a few pictures. 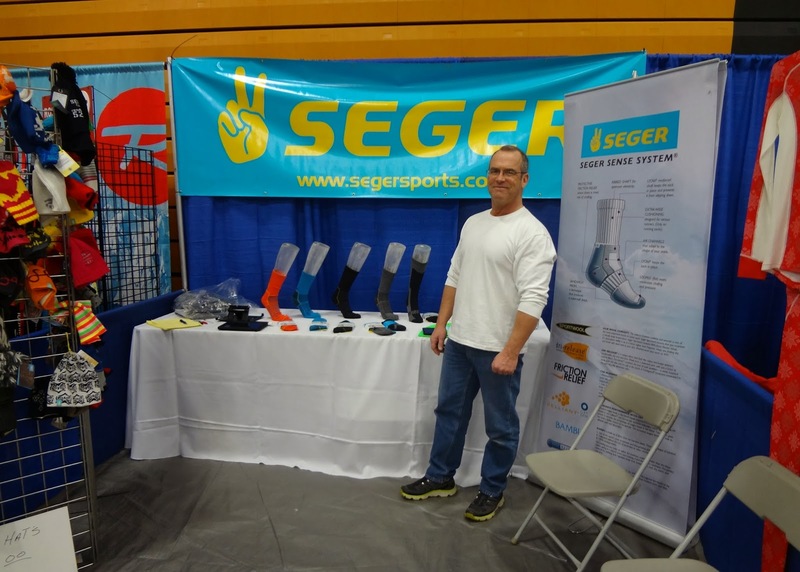 There were high school and college students from all over the nation competing. 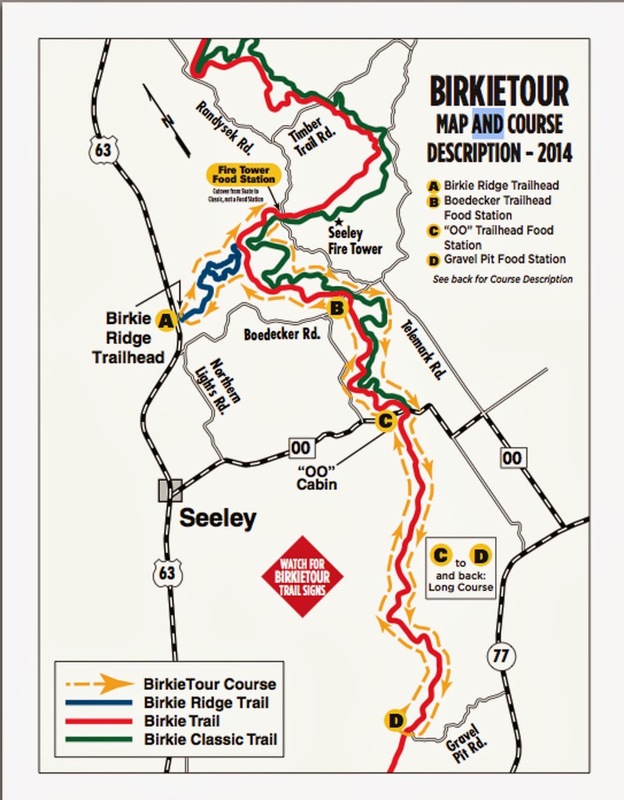 This is the map of the Birkie Tour 2014 that shows the 26K and 44K routes. 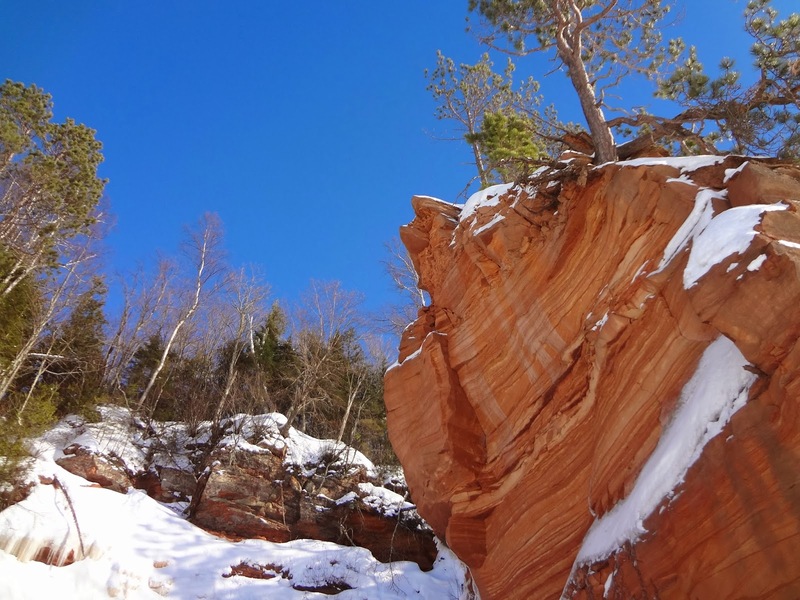 Both started at the new Birkie Ridge Trailhead. The upload from my Suunto can be found at the MovesCount website. The time was slow because this was not a race and we stopped along the way several times to talk and take in the scenery.